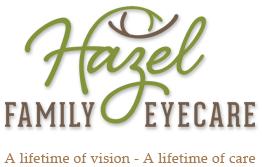 We know that your sight is vital and your eyes are irreplaceable and rest assured that you will undergo thorough ocular testing and comprehensive eye examinations at Hazel Family Eyecare. Dr. Tara Fowler understands the importance of early detection and preventative care for eye diseases. Our comprehensive eye examinations include the determination of your visual status and a detailed look at the health of your eyes. Dr. Fowler is thoroughly trained in the diagnosis and treatment of eye diseases, infections, and ocular injuries. Pediatric Comprehensive Eye Examinations - We would love to take care of your family’s eye care needs. We start children eye examinations at approximately 4 years of age. Comprehensive eye examinations includes not only the determination of your visual status, but also a detailed look at the health of your eyes.